Celebrate the start of Lost Nation Theater's 2019 Season - the start of its 4th decade presenting quality professional performance and education programs for its community at Montpelier City Hall! 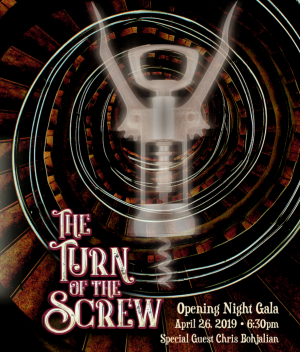 Celebrate the official opening of our season opening production The Turn of the Screw! The fun starts with a catered reception at 6:30pm, featuring delicious hors d'oeuvres and a cash bar (one bar drink is included with your ticket) from Woodbelly Pizza, and keynote remarks by best-selling author and playwright Chris Bohjalian. Then LNT's Chris Scheer and Laura Erle will make your spine tingle with their sensational, edge-of-your-seat performance! The evening finishes with "Turn of the Screw-Drivers" (made with Caledonia Spirits "Barr Hill") Toast & Party with the entire Production Ensemble - with decadent desserts. The Gala is a fundraiser for LNT. Tickets are $60 per person (o $100 per couple - use the discount code: galacouple). Season Ticket Holders call the box office - 802-229-0492 - for your special discount. The Turn of the Screw is a highly theatrical adaptation of Henry James' classic psychological thriller by Jeffrey Hatcher. LNT's production stars favorites Christopher Scheer and Laura Erle. Special Thanks to National Life Group's Darry Garland for inspired and gorgeous design of our Gala Invite! And to Villanti Printers for the luscious printing! “I love the way theatre builds community: it satisfies the human craving for story and it encourages us all to be a little more empathetic and engaged. And the creativity and artistic vision of Lost Nation Theater?